If you haven’t heard of Botox, you’ve probably been sequestered in a lighthouse out on Nahant. For everyone else, Botox has become such an identifiable brand name that you may think it has been around for decades. Not so…at least not when it comes to erasing wrinkles on the upper third of the face. Botox has been around for decades treating problems such as involuntary eyelid spasms. But it was 2002 when Botox left the realm of medicine and entered the pop culture. That was the year the FDA approved Botox for the cosmetic treatment of wrinkles and lines. Ever since its aesthetic debut, Botox has dominated the yearly statistics for cosmetic procedures worldwide. It is far and away the most performed procedure, surgical or non-surgical, the world over. And with all the celebrities who swear by it, Botox could merit having its star on the Hollywood Walk of Fame. What makes Botox so popular? It works. Botox is the king of what are called dynamic wrinkles, wrinkles that are formed by muscle contractions. Dynamic wrinkles are crow’s feet, frown lines, the 11s. But Botox doesn’t have any sway when it comes to static wrinkles. These are wrinkles that show themselves at all times. Sun damage, environmental issues, and general aging of the skin create static wrinkles, and Botox does not affect them. Dermal fillers are the injectables intended for static wrinkles. 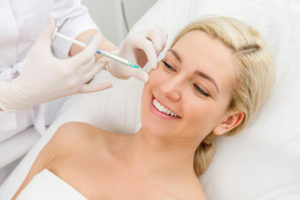 We offer Botox injections at Cosmetic Dentistry Center. How does Botox perform its magic? Dermal fillers “fill” in the wrinkle from beneath. Botox works in an entirely different manner. Botox is called a neuromodulator. It is made from the botulinum toxin type A, the same bacteria that cause botulism. Decades ago scientists discovered that the botulinum toxin, when used in very small amounts, could temporarily paralyze a muscle. It does this by blocking the signals from the nerve to the brain. Without those messages, the brain doesn’t tell the muscle to contract. When you perform everyday behaviors such as squinting or frowning, muscles contract as part of the behavior, particularly those around the eyes. Over time as your skin ages and loses some of its elastin (which helps keep the skin supple), these contractions cause wrinkles to show on the skin surface above the muscles. Botox blocks those muscles from contracting, so the wrinkles either disappear or their appearance is dramatically reduced. When opting to have Botox injections, however, it is important to choose a doctor thoroughly versed in facial anatomies, such as Dr. Walk or Dr. Bamel. Injecting too much Botox or injecting it into the wrong muscle can create issues such as droopy eyelids. Botox results last around four months. At that point, the muscles will start contracting again, and the wrinkles will return. That’s when it is time to schedule another Botox session with the team at Cosmetic Dentistry Center to maintain your results. Interested in telling your crow’s feet, the 11s between your brows, and your forehead wrinkles who’s the boss? Call us at Cosmetic Dentistry Center, (617) 965-7673 and ask us about Botox.